"For businesses and brands, Google+ pages help you connect with the customers and fans who love you. Not only can they recommend you with a +1, or add you to a circle to listen long-term. They can actually spend time with your team, face-to-face-to-face. All you need to do is start sharing, and you'll soon find the super fans and loyal customers that want to say hello," says Google. Google+ pages look like Google+ profiles, but there are some differences: pages can't +1 other pages, don't support notifications and "can't add people to circles until the page is added first or mentioned". People can add pages to one of their circles and there's a new built-in circle called "Following" that can be used to follow pages. The circle is used to automatically follow pages if you enable this option. If you've been wondering why the + operator no longer works in Google search, the answer is that you can now use it to find Google+ pages. Type +google in the regular Google search box, press Enter and you'll be sent to Google's Google+ page. This only works for a small number of pages and the search box is smart enough to autocomplete the page's name. 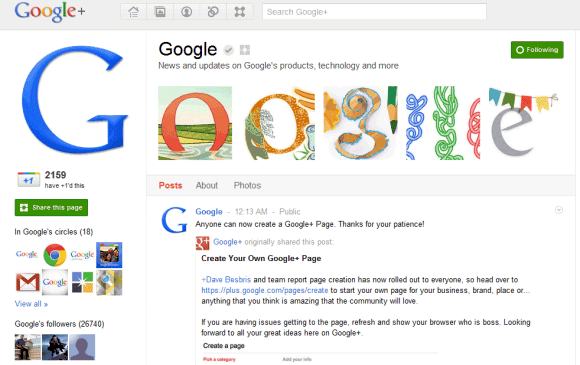 To test the new feature, I've created a Google+ page for this blog where you'll find more news and tips about Google. 1. If I create a page, can I transfer it to another account if I don't want to maintain it anymore? 2. Can there be more than one page that is called the exact same thing? Love it. But can an organization have more than one person that is able to post content and manage the page? I was literally in a seminar for facebook and social media marketing and we were talking about how Google+ didn't have business pages yet! Awesome news! They've announced their will be a feature to select multiple admins, transfer ownership, etc. It's coming.. I was getting the message about + not being supported anymore in the google search result till last week; but this week again I started getting the search results for exact work by putting a plus and not requiring the quotes for searching the exact term. Yay! Now you can run a blog without RSS. Brillant. Google Plus has been going downhill for months. It just doesn't have any buzz. Google+ Pages for Business Released! The long expected Google+ Pages for Business have just been released, but with a disappointing outcome! The scarce features are no match for the current features offered by Facebook pages. The only innovation they brought is the Google+ Direct Connect. "People can add pages to one of their circles and there's a new built-in circle called "Following" that can be used to follow pages. The circle is used to automatically follow pages if you enable this option." Alex, care to point where exactly is this option of automatically follow pages in Following circle? I don't see it anywhere in G+ settings. Go to https://plus.google.com/u/0/settings/plus and check "Automatically add a Google+ page to my circles if I search for + followed by the page's name." in the Google+ Pages section. Definitely happy to see that they did this. :) People can finally start with their business campaigns on Google+. Three cheers for Google!